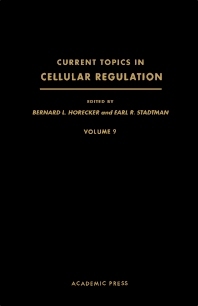 Current Topics in Cellular Regulation, Volume 9 presents the fundamental mechanisms involved in the regulation of diverse cellular activities, including cellular differentiation, intermediary metabolism, and the transfer of genetic information. This book provides information pertinent to the various aspects of cellular regulation. Organized into six chapters, this volume begins with an overview of the properties of the various hemoglobins present in trout blood. This text then introduces an interesting system for the study of differentiation and morphogenesis, the unicellular prokaryote Caulobacter crescentus. Other chapters consider the possible function of intracellular proteases in the regulation of enzyme activity in microorganisms and in their adaptation to changes in environmental conditions. This book discusses as well the physiological role and regulation of malic enzymes. The final chapter provides a comprehensive kinetic analysis of the phenomenon of enzyme induction in both eukaryotic and prokaryotic cells. This book is a valuable resource for biochemists, biologists, and research workers.